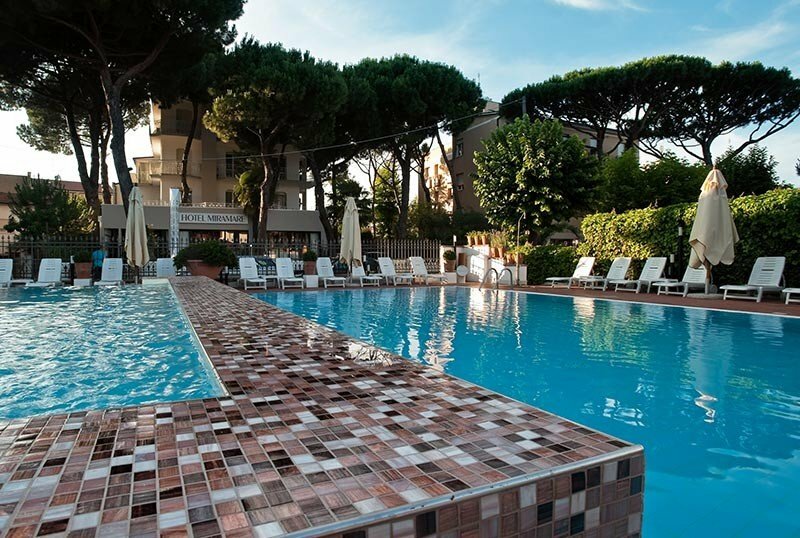 Hotel Miramare is an elegant 4-star hotel in Cervia, just a few minutes walk from the sea and surrounded by a large garden. It has an outdoor pool with a slide, as well as a spa, gym and free parking. The hotel is ideal for families thanks to the services dedicated to children, including mini and junior club and entertainment. Admits small and medium-sized pets. The hotel is located in the center of Cervia, in the immediate vicinity of the canal harbor and less than 5 minutes walk from the sea. Moreover, it is possible to reach the historic center in less than 10 minutes through Viale Roma or along the canal, two main streets full of shops and restaurants. The rooms have been recently renovated and are furnished in a modern and elegant style. All have balconies, 22 '' digital terrestrial TV, minibar, safe, air conditioning and private bathroom with shower, hairdryer and vanity mirror. In addition to the Classic rooms, with all the services already listed, the hotel has other 3 types of rooms. COMFORT ROOMS: have a view of the parking or front of the pool. 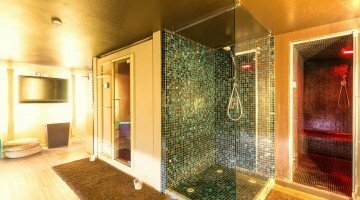 SUPERIOR ROOMS: the services described add a bathtub or a hydro-massage shower. ELEGANCE SUITE: larger than the previous ones, with a panoramic view, 2 LCD TVs, a Turkish bath and different types of accommodation packages. Large enclosed garden, open-air porch, swimming pool for adults with slide and smaller pool for children, solarium area with sauna, turkish bath and Jacuzzi. Guests have access to a reading room, an American bar, a gym, free bicycles, beach towels and a paid laundry. PARKING: available for free subject to availability. CONVENTIONS: beach, INAIL / INPS. BREAKFAST : international buffet breakfast with homemade pastries, yogurt, fruit and savory dishes. LUNCH AND DINNER : the kitchen offers 3 choice menus with meat and fish dishes accompanied by a vegetable buffet. VARIATIONS : vegetarian dishes are available and, on request, vegan and celiac dishes. In the hotel: children's pool, baby / mini club, live entertainment and playground area. Changing tables are also present in the shared bathroom in the hall. In the room: crib, toilet reducer, bath tub and fall barrier for the bed. At the restaurant: baby menu, baby food, baby food, baby seats or rucksack chair, bottle warmer, sterilizer, afternoon snack, colored placemats, unbreakable dishes and glasses. On the beach: fenced children's playground area. Guests can relax in the large outdoor pool, equipped with slides, air pools and a children's pool. The solarium area extends, with a children's playground area and a gazebo where you can relax and enjoy aperitifs and snacks. A large relaxation area ensures well-being and tranquility thanks to the qualified staff and services available on reservation, including turkish bath, hot tub blower, shower, Jacuzzi, solarium shower and sauna. In the fitness area, however, you will find everything you need to stay fit: Technogym gear, treadmill, stretching rugs, elliptical cross and more. 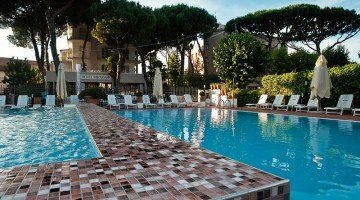 The hotel has an agreement with the Bagno Sorriso n.228-229, with bar and restaurant service, beach beach umbrella, cabins, beach volleyball courts, beach tennis, basketball and bowls, as well as a mini club, a playground of 900 square meters and hot showers. It also offers free WI-FI coverage.